I started buying whole chickens to make salads for my husband’s lunch and knew I needed to make broth with the bones. I’ve been reading a lot about the health benefits of homemade bone broth, but I was more even more motivated by the cost savings. I buy at least one carton of chicken broth at the grocery store each week, and even the cheapest containers cost $2 (on sale). 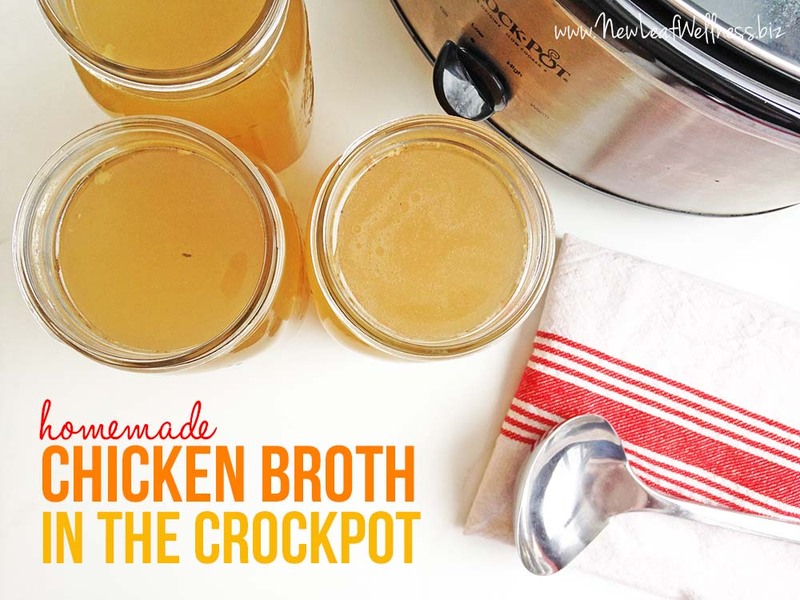 Since I’m addicted to my crockpot, I knew I had to make my chicken broth in it. It seemed much easier and less intimidating than the stovetop. Plus, I can leave the house instead of hanging around a boiling pot all day. My mom told me that she saves scraps from carrots, celery, and onions to flavor her broth, so of course I had to do the same. 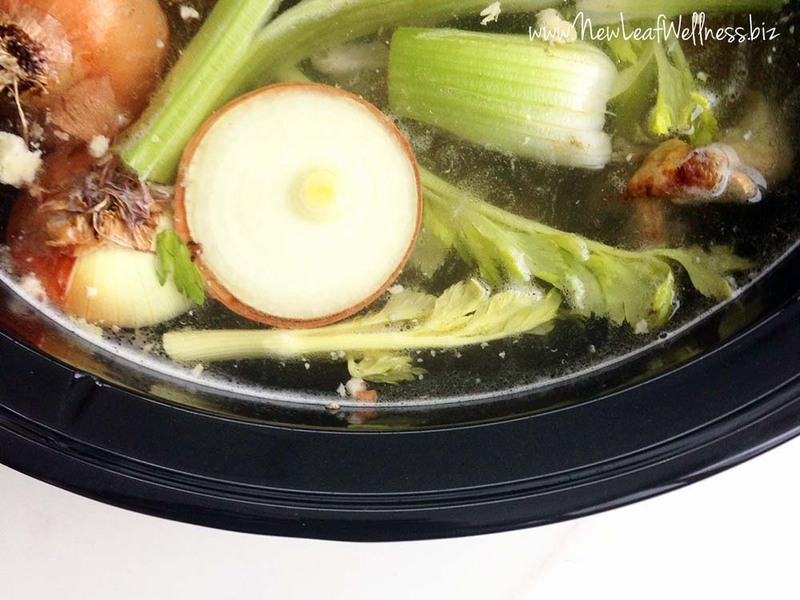 By making this crockpot chicken broth with bones and washed ends of carrots, celery, and onions, it’s literally free. If you don’t have any scraps on-hand, never fear – Just make your broth with fresh veggies as described below. 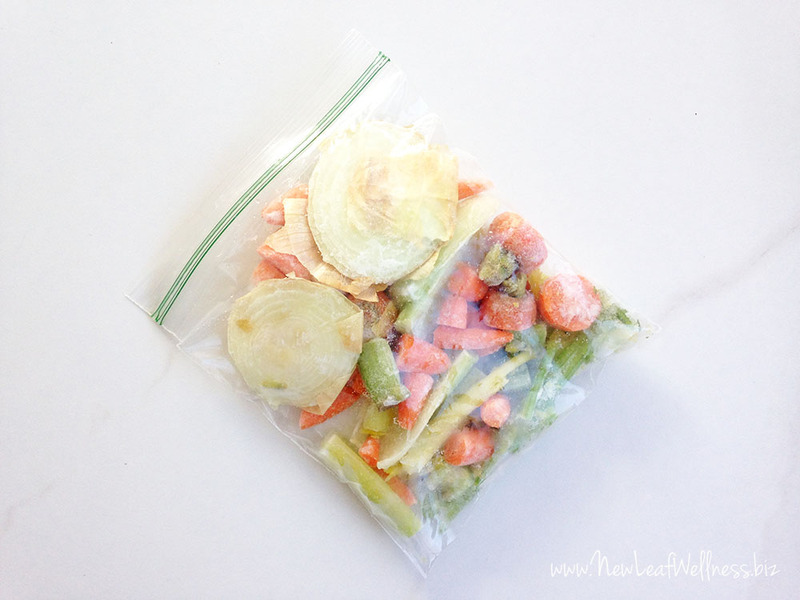 Then, save your scraps in the freezer from here on out. Add lid, and cook on low 8 hrs or on high 4 hours. You will know when the broth is done because it will take on a darker color and smell amazing. Use broth immediately or save for later. If you’re going to save your broth for later, cool it to room temperature and then add to your refrigerator or freezer. 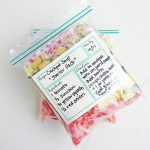 Most of my soup recipes call for four cups of broth, so I use quart-sized freezer bags. I don’t add any salt to my broth when I’m cooking it. I’d rather add add salt to taste based on the soup recipe that I’m making. 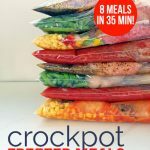 The total amount of chicken broth will depend on the size of your crockpot, but I get about 12 cups of broth from my 7-qt crockpot (affiliate link). I’ve been making my own broth for a month now and haven’t needed to buy any at the grocery store. Yay! Thoughts or questions? Please leave a comment below. I’d love to hear from you. Thanks for the great recipe. I was wondering how many days broth will last in the refrigerator. 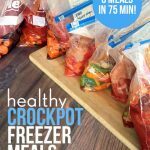 And how long in the freezer? I think it will last one week in the refrigerator and 3 months in a standard fridge/freezer combo. You’ll love it, Meghan. So easy to make! Yum. Love the idea of cooking it all night. That would give it lots of time during the day to cool before freezing. Thanks, Ann! 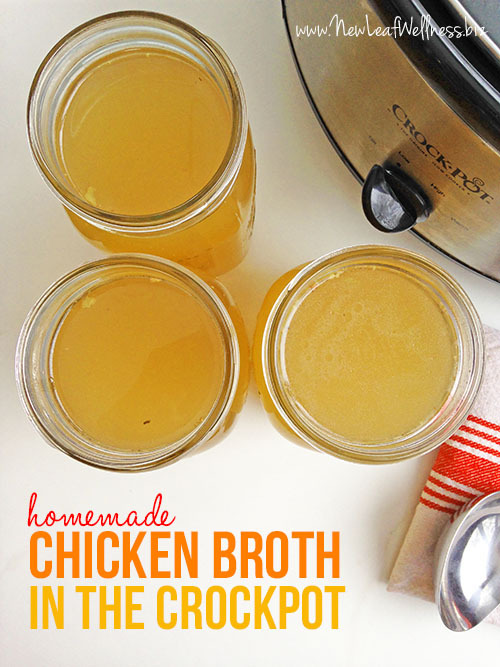 I make my own chicken broth like this now too. Once I did it once, I realized how incredibly easy it is. 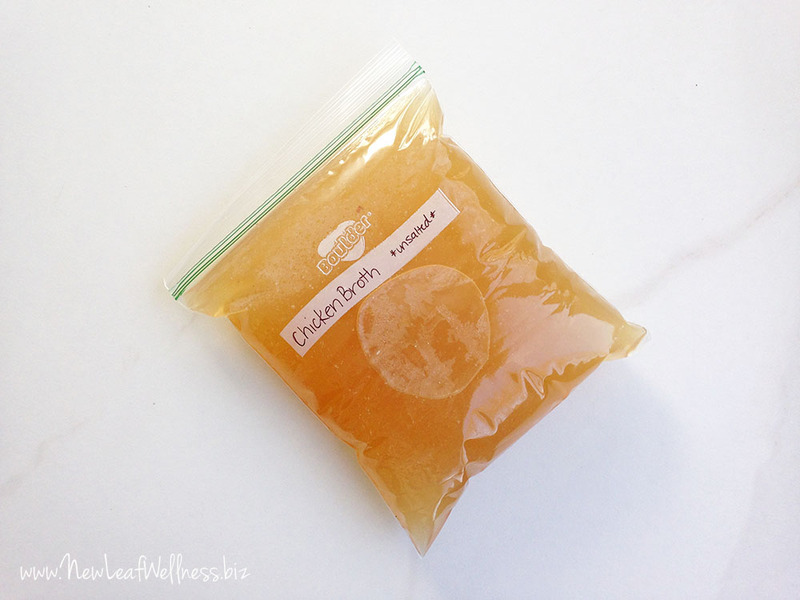 Now I make and freeze broth anytime I have leftover chicken bones! I know. I don’t know why I didn’t try making it sooner. I have the crockpot out making chicken broth as we speak. I also do like your mom and save veggie scraps. And I toss in some whole peppercorns, a bay leaf, and some dried thyme. I use the chicken broth for all kinds of things: chicken soup, as liquid in my cooked beans, in my lentils, as liquid when I cook brown rice in the rice cooker. It is a staple around here.